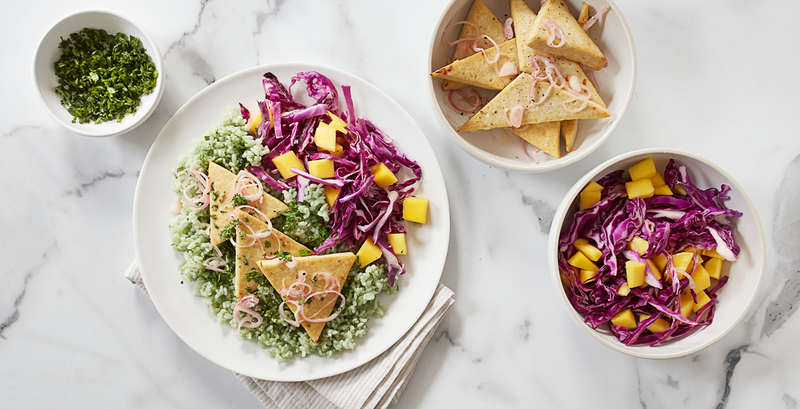 Purple Carrot is a vegan meal kit delivery service that seeks to provide consumers with an easy way to work more plant-based meals into their lives -- a perfect fit for the Meatless Monday movement. Mark Bittman set the culinary world abuzz when he announced he was leaving his position as a New York Times columnist to join a startup. His new gig is with Purple Carrot, a vegan meal kit delivery service that seeks to provide consumers with an easy way to work more plant-based meals into their lives - a perfect fit for the Meatless Monday movement! Mark and I recently chatted about encouraging people to eat less meat and the delicious meals he's working on at his new company. Meatless Monday has been encouraging the public to skip meat one day a week for over a decade. You're a big advocate of partial veganism, first with VB6 and now at Purple Carrot. Why do you think encouraging people to go meatless some, but not all, of the time will result in more lasting change? Among us, no one believes that the smart thing to do is to convince Americans to become vegan or even vegetarians. We both think that people should eat more plant-based meals and we both think that it would be unreasonable to demand or encourage people to give up meat entirely. We don't really know what the perfect recommendations would be around these kinds of things but we do know that for both environment and public health reasons, it would be better if all of us ate less meat and this is a strategy. Do you think people need a push to eat less meat, such as a reminder that it's Meatless Monday or a Purple Carrot box showing up on their doorstep? Well if you sign up for Purple Carrot, it's a bit more of a stick than Meatless Monday because the box is going to show up, so once it shows up presumably you're not going to throw it out, you're going to actually do it. So if we say you're getting two or three Purple Carrot meals a week and people sign up for that, it's a pretty safe bet they're actually going to cook two or three vegan meals a week. Well they've paid for it. Meatless Monday is free! Yeah, Meatless Monday is more of an idea. Why work with a service that sends people ingredients to cook meals from scratch? Wouldn't you get more people to eat meatless meals if you did some of the work for them and sent frozen or otherwise ready-prepared meals? Two reasons. The first is I want to encourage people to cook and this eliminates two or three excuses people have for not cooking. One, there's no shopping, two, there's no figuring out the recipe and three I guess there's no waste, we are premeasuring ingredients effectively. And the second answer is that I think that cooking means cooking. I'm not against freezing food, but there's definitely a loss in quality when you take something, cook it, then freeze it and then defrost it and eat it. It may not be a loss of nutrition and it may not be a safety factor, but there is nothing like a freshly cooked meal, obviously. So what happens when people gain so many cooking skills from making your meals that they decide to go to the grocery store themselves and cook your recipes? Is that going to put you out of business? Great answer! Can you tell me about some of the recipes? Well it's funny that some of our customers are saying that our calorie counts are too high. And my argument there is that calories are not everything and that a high calorie vegan meal is not the same as a high calorie meat-based meal and it's certainly not the same as a high calorie junk food meal. In fact, a big discussion going on right now is about whether all calories are the same. That's true. Although the meals we tested here in the Meatless Monday office were about 700 calories per serving, which is a reasonable third of a 2000 calorie diet, provided you're not snacking all the time. So how do you design recipes that carnivores will like? I had your Mu Shu seitan and it knocked my socks off! I really would have thought there was meat in it. Seitan is really quite incredible. But I don't think we're scientific enough for me to answer that question, we're just trying to make the best food we can make. I mean if it doesn't taste good enough we try to make it taste better. The hot mustard in the seitan dish really gave it an interesting kick. Do you find that certain flavors or sources of umami appeal more to the meat-eating crowd? We've been accused of doing too much Asian stuff. I think there's a way in which Asian food tends towards veganism and it's not so reliant carbs, as a lot of Western meals are. It's really an education for me, we're dealing with quite a number of different things but it's not scientific. We are cooking, we're trying to make things taste really good. Of course umami is a part of that but I don't think anyone's ever said "this doesn't have enough umami." I think we've just said "this needs to taste better." What are your favorite meals so far? I thought that that seitan thing was amazing also. They are going by in a blur because we're doing three a week. There's a chickpea thing we're doing that I like a lot. I thought the aloo paratha was great. We did pasta with white beans, very simple, I loved that. Nothing goes out that I don't think is terrific. I guess I have favorites, but it's clear from the mail we're getting that I'm not the judge of everyone's tastes. Some people like some things and some people like others. I think in general people seem quite happy with what we're shipping so we're just going to keep going. Well we hope Purple Carrot makes it that much easier for people to go meatless on Mondays. Thanks for chatting! 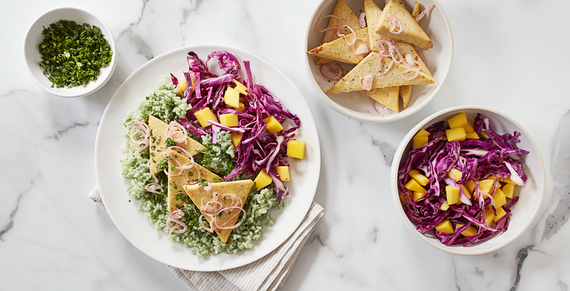 Check out Purple Carrot's recipe for Tofu Escabeche with Bamboo Rice and Mango Slaw on Meatless Monday this week. 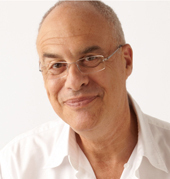 Mark Bittman photo by Romulo Yanes.